Protection of our natural environment is at the forefront of North Queensland Bulk Ports’ business planning and operations. We are the only port operator in the world to run three major ports within a World Heritage Area. This is a responsibility that weighs heavily in our decision making. We work with a clear focus, ensuring we always reduce and manage any potential environmental impact. We care about getting the balance right. Our mission is to add value to the prosperity of the state, customers and communities, while demonstrating high levels of social and environmental integrity. 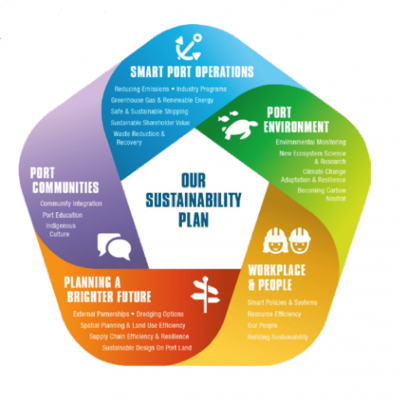 In August 2015, the NQBP Board endorsed Sustainability Plan 2015+, setting a benchmark in the Australian port industry for whole-of-business sustainability planning. The plan recognises that managing a sustainable business strengthens the organisation’s core ability to grow trade into the future, for the benefit of Queensland and Australia. Port communities: integrating with communities and ongoing learning. The plan will be reviewed each year to ensure NQBP remains abreast of emerging industry trends and new technologies. While environmental activities occur across all four trading ports, the main focus at each port differs. Air quality monitoring is a key responsibility for NQBP at the Port of Mackay. Coral, marine water and seagrass monitoring programs are also in place at this port. Recently, a regional alliance was developed to look at stormwater runoff in the Mackay region. We are proud to partner with Mackay Regional Council and Reef Catchments, and hope to implement management strategies to improve stormwater runoff. At the Port of Weipa, we continue to work within stringent environmental guidelines to ensure safe navigable shipping corridors to and from the port. Maintenance dredging is necessary to provide safe, sustainable and competitive seaport services. The dredging program is completed with full environmental compliance. Abbot Point is a designated Queensland Priority Port and, as such, capital dredging is required to allow for future growth of coal export capacity from 50 to 120 mtpa. Dredging at this port is subject to environmental approvals and the outcomes of seagrass, marine water and coral monitoring. As one of the largest coal export ports in the world, our focus here is on consistent coal dust and air quality monitoring. In place for nearly 20 years, this program is designed to improve dust management practices at the port. The results of the most recent studies showed that all monitored community sites around Hay Point were in full compliance with the national air quality standards. Coral, marine water and seagrass monitoring programs are also in place at this port. View key environmental activities at each port in more depth. NQBP requires an Environmental Impact Statement (EIS) for major projects on port land. NQBP’s environment policy outlines how it is committed to protection of the environment and to the sustainable management of its ports and activities. Read more about applying to develop on port land. In 2017, along with other industry-leading organisations, we attended the Australasian Coasts and Ports conference. We took part in discussions with other delegates around the theme of ‘Working with nature’ and shared valuable insights and learnings on a range of multi-disciplinary issues impacting Queensland’s diverse and developing coastline. Thought leaders from our organisation spoke on topics including sustainable sediment management and the PIANC Guideline (Environmental Risk Management of Navigational Infrastructure Project), as well as Port Sustainability Leadership in Tropical Australia. We’ll continue to lead by example and to make sure our commitment to environmental protection is highly visible, striving to encourage a similarly steadfast commitment across all industries. Our role as an environmental guardian is also practical and ongoing. Every day we operate our ports to the highest international standards through our Environmental Management Systems (EMS), which are certified under AS/ISO14001:2004. Find out more about our environmental management practices.